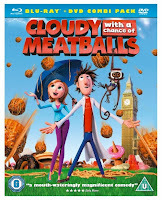 We recently received Cloudy with a chance of Meatballs to review for Sony films. It's about a budding scientist called Flint (voiced by Bill Hader) whose invention can turn water into food. When his machine runs amok and rockets up into the sky, food starts raining down on the town of Swallow Falls. A weather girl Sam Sparks (voiced by Anna Faris) becomes involved and helps him to prevent a global disaster of epic food proportions. I think I'll just say that it wasn't our cup of tea. The Teenager turned her nose up at it as 'not cool' and Tall Daughter got bored halfway through and turned it off, although we did enjoy using the interactive Splat button which lets you throw food at the screen while watching the film. Not real food of course, that would be a terrible waste. Which reminds me, I got an email yesterday from a very well known company offering me an item to offer as a giveaway on my blog. They were offering a 'dual sensual massager' for couples.....which is a bit rich seeing as I've been single for donkey's years. I declined the offer, although I was very tempted to ask for one for single women. I mean, isn't there more of a need there if you see what I mean. I'm going to stop there before I write something incriminating. Ahem. Anyway, If you'd like to watch the film and decide for yourself, please leave a comment and I'll pick someone randomly (if there is more than one comment, that is!) later in the week. Don't say I never give you anything! *A Modern Mother's 8-year-old daughter also reviewed the film and she liked it.